Foot injuries are the third leading cause of injuries in NCAA athletes that have to be removed from competition, with a large number attributed to the hallux metatarsophalangeal (MTP) joint. In turf toe injuries, one or more structures of the plantar complex of the first MTP joint are injured. Injury classification helps to guide management and aids in determining prognosis. 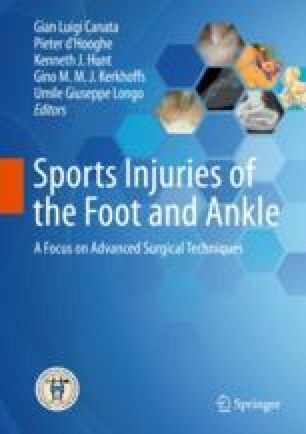 Surgical intervention for turf toe injury is often undertaken after nonoperative management has failed for mild injuries or in the case of severe injuries to restore function and anatomy. This presents a review and surgical consideration of the turf toe injury in athletes. Anderson RB. Sports foot and ankle injuries: an update. VuMedi web resource. 2018 . https://www.vumedi.com/video/turf-toe-jones-fracture. Accessed 20 Sept 2018. Anderson RB. Repairing turf toe injuries. AOFAS web resource. 2013. https://www.aofas.org/PRC/meeting/Documents/RepairingTurfToeInjuries.pdf. Accessed 23 Sept 2018.